UPPCL Admit Card For Skill Test 2018 Released !!! Latest Update (28th December 2018): UPPCL Admit Card For Skill Test 2018 Released!!!. Check all the required Information end of this Page. Check Admit Card For Skill Test >>>DOWNLAOD HERE NEW!!!! See the link of UPPCL Office Assistant Call letter now by means of this article. 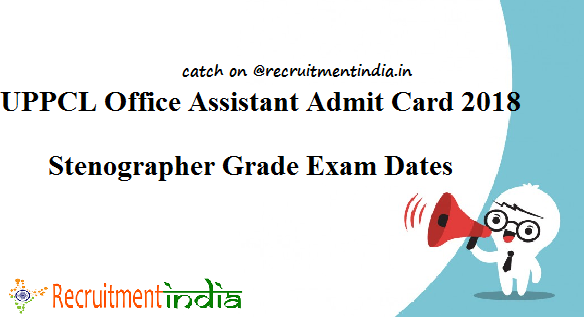 This will intimate about the arrival of the UPPCL admit card for the 2859 vacancies in the posts of Stenographer Grade – III, Office Assistant Grade – III. In Uttar Pradesh State, lakhs of applicants are very much stressed in searching for the online links of the hall ticket to hear about the UPPCL Exam dates and venue of the exam. If they got the link in that circumstances only they can check their exam dates, exam organizing place. In case they are unsuccessful in identifying the links of the admit card, then they cannot able to download the pdf of hall ticket. Thus leads to no entry for the exam. Yes, if they do not bring the UPPCL Office Assistant Admit Card 2018 print out on A4 sheet they don’t have the access to write the exam for the posts of Office Assistant. But that situation will not arise if you follow our site Recruitmentindia. in since you can locate the download link of any exam admit card through our site. If you see this post once, you can easily get the link which you want. Check UPPCL Exam Dates of Office Assistant, Stenographer Grade-III Exams: Uttar Pradesh Power Corporation Limited (UPPCL) is the only organization for the electricity generation in the state of Uttar Pradesh. So you can imagine how many employees are working on it. The exam of office assistant and Stenographer posts are for the recruitment of new candidates in 2859 vacancies in these two designations. So don’t ignore this exam seeing a high number of vacancies.The competitors in the exam will also be in that proportion only. Up to now by checking the updates we knew that the official exam date of UPPCL for 2859 jobs is not disclosed by the exam panel of UPPCL. Then now you have the chance to get the good marks in the exam if you start preparing for it now onwards. Get the syllabus of UPPCL and begin studying those who have not started the preparation of this UPPCL exam. At www.uppcl.org Admit Card can be made to download. You have to sign into the site to verify the link to download the online UPPCL Admit card to write the UPPCL exam of both Office Assistant, Stenographer Grade-III . The applicants who have filled the application for this vacancies will soon came to know the exam dates of these posts. But it needs some patience for the candidates to wait for the exam since one month has been completed from the date of closing of the online registration process. But this time gap to announce the exam dates through UPPCL Office Assistant Admit Card is due to checking the submitted applicants. If the proper scrutiny is not done, some non -eligible candidates will come to write this exam. That may lead to loss of the correct applicants . So to give chance to only eligible candidates the officials will refer them by the use of their applications. If the details are okay in the application form, then they intimate to individuals that they have to get ready to write the exam on the UPPCL Exam Date, time and place. Check more UP jobs here in this page. Notice the official link of UPPCL Office Assistant Admit Card 2018.